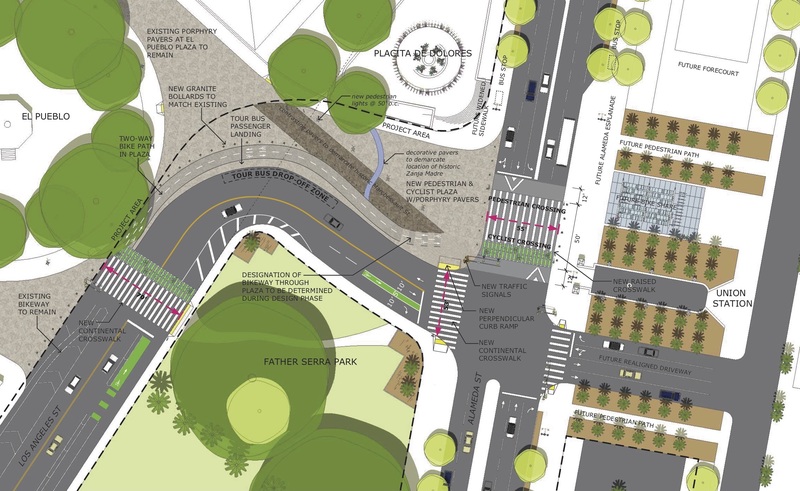 Metro has released the Final Environmental Impact Report (FEIR) for the Los Angeles Union Station Forecourt and Esplanade Improvements project. This project is located in front of Los Angeles Union Station and on adjacent streets. 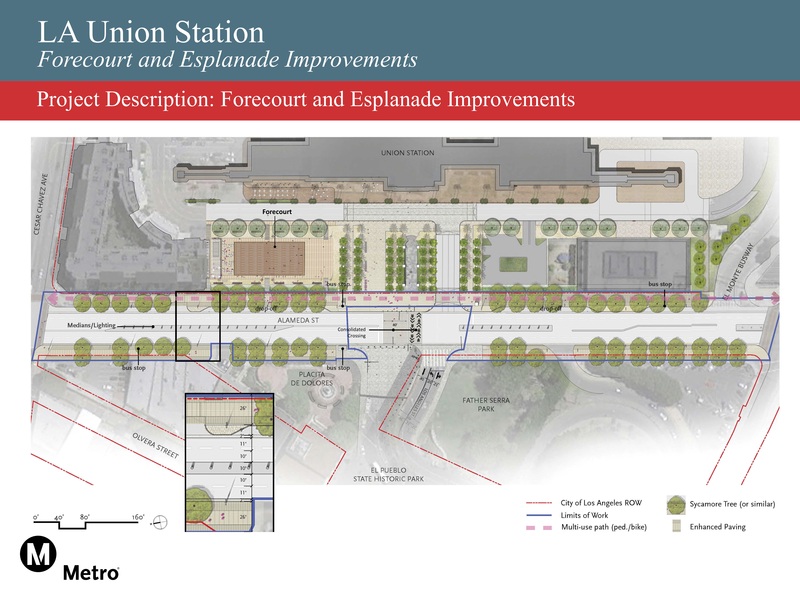 The proposed improvements replace a parking lot with a civic plaza and provide better pedestrian and bicycle connections between Union Station and surrounding neighborhoods. The FEIR includes Metro staff’s recommendation for Alternative Three, which includes a partial closure of Los Angeles Street, a restricted left-hand turn onto Alameda Street from Los Angeles Street, tour bus parking on Arcadia Street during off-peak hours and a two-way off-street bicycle path within the expanded El Pueblo Plaza. On the east side of Alameda St, a pedestrian/bicycle path with shade trees. New curb-side drop-off zone(s) on the east side of Alameda Street, replacing one northbound vehicle travel lane. On the west side of Alameda St, wider sidewalks in place of one southbound vehicle lane. Closure of the northern lane of Los Angeles Street between Alameda Street and El Pueblo crosswalk. Reconfigured driveway into Union Station, including a consolidated, expanded crosswalk between Union Station and El Pueblo Historic Cultural Monument. Reconfiguration of the parking lot at the front of Union Station, including addition of a civic space, sustainability components and a seating area. Small structure to serve transit riders. The Statement of Overriding Considerations, Findings of Fact, and Mitigation Monitoring and Reporting Program are also available on the project website. Thanks for Going Metro to DTLA on Saturday!